0800 163 382 Want a price for your project? No problem. No obligation. Joint Sealing Pull Test Maxicrete Concrete Patch Repair AGL Installation Get In Touch! Castle and Pryor work extensively in the transport sector, specialising in aviation, rail and road projects. With a wealth of experience at both London's Heathrow and Gatwick airports, Waterloo and Reading stations and highways over the country, the transportation sector is a definitive industry within our experience portfolio. We are experienced airport contractors at both civilian and military airports and our operatives and equipment are certified and approved by the British Airports Authority and the Department of Transport. We are certified to undertake airport contracts and we have considerable experience operating within aviation facilities. We have successfully completed major diamond core drilling, diamond cutting, concrete saw cutting, rock splitting and breaking operations at Heathrow and Gatwick Airports. 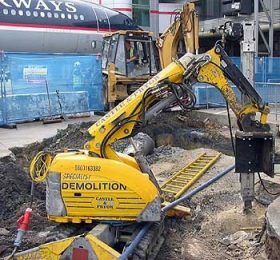 By owning and operating specialist diamond concrete drilling and diamond cutting equipment specifically procured for airport infrastructure operations we can deliver bespoke services 'airside' at all UK airports. At Heathrow airport we have worked diligently with many major and medium sized businesses supporting the redevelopment, over the years, of Terminals 1-4 and new build of Terminal 5. Alongside this we have most recently assisted in the development of a British Airways hangar to provide engineering works on the Boeing Airliner 787 Dreamliner and the development of piers and remote stand requirements for the Airbus A380, on behalf of Malyasian Airlines. Our rail experience is extensive and varied from working on projects that require demolition between 2 live railway lines at Reading station, removal of wall sections beneath the station concourse at Waterloo train station to Crossrail project work at Whitechapel and Liverpool street stations. We find that our extensive skills are required for a mix of diamond core drilling, diamond cutting, sawing and Brokk demolition. L.A Senior Programme Manager, Network Rail. Within the transportation sector we have been commissioned to complete works on several projects on highways, roads, walkways, central reserves, hard shoulders, subways and bridges. We have been contracted to work on the M23, M27, M3 to name but a few, consisting of diamond core drilling and diamond sawing for barriers on carriageways, diamond core drilling for bridges and diamond saw cutting through concrete for resurfacing projects. Our customers consist of local authorities, the highways agency and EM (Enterprise Mouchel).